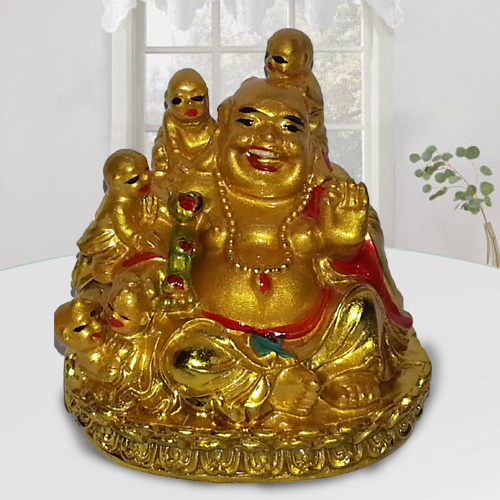 Laughing Buddha surrounded by 5 jolly, happy and active children, he is must for couples who are trying to conceive without luck or they wish their homes are filled with more joy and laughter. Laughing Buddha loves children, having him at home will ensure your children are protected from harm.1) To bring prosperity, good fortune, wealth luck in any business best place to keep in living room, Dining room, Bed room or Office in South-East Direction. To bring Good Health and Happiness for your family. Remove all your problems and worries of your family best place to keep in living room, Dining room, Bed room or Office in East Direction.